RPG(role playing games) is a genere loved by many gamers. Weather it is Final Fantasy or pokemon or kemco games, rpgs have found a place in the hearts of many. RPGs are so popular because these games try to stimulate real life. In real life we need experience to achieve anything and experience is gained through hours of practice. RPGs stimulate this. Most of these games have a level and stats system. Each character have unique stats like strength, vitality, intellect, magic etc. When player wins a battle he is awarded some experience point that are added to the level bar and the bar increases. When level bar is maximized the character level is increased with that his stats also making. Intresting. Isn’t it. Gamers spend 10s of hours in winning more and more battles to gain experience. The rising level bar keeps them motivated. Maximizing the bar gives them immense satisfaction and motivation to carry on and on. Will it not be wonderful if we can bring this motivation in our real Lives. If we can visualise our goals or targets like bars. If we can create a stat system for us. This will keep us motivated always. It is proven that results that can be seen with naked eyes act as better motivater. But there is a basic problem. Most of our stats do not have a measure. Tell me how will you measure your health, vitality or intelligence. You can say go for regular check ups or take it test every month. But these all are money and time consuming and may not worth your efforts. Also there is no measure for qualities like love, compassion or will power. Is there? So what we do? What is the solution? We want a way that is simple, easy to understand, effective and can measure anything. This is a goal tracking app but it has an additional feature that separates it from other such apps. It uses bar to track your goals. You can track by time (eg: how much hours I study) or by amount (no. Of pages etc.) and at last the feature I was talking about. A level up system. It is similar to the level up system. You can track things that usually have no measure or difficult to measure. Take this example. This is the screenshot of my stats. You can see the four bars that I track. 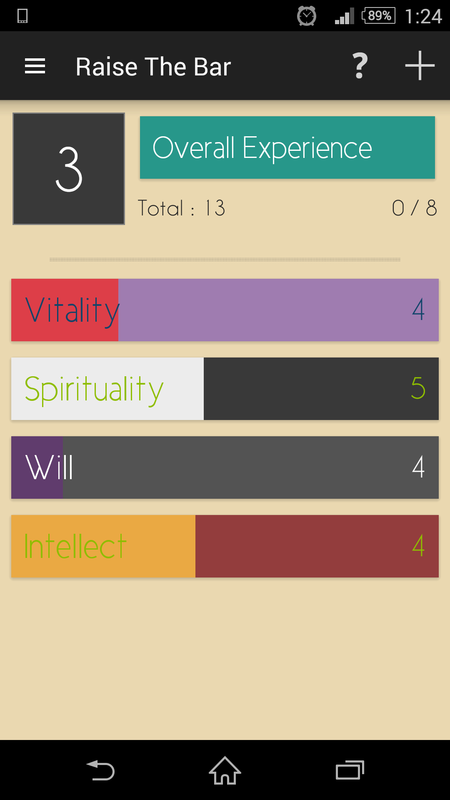 Vitality, will, spirituality, Intellect. You can award yourself points whenever you do something positive related to what you are targeting. Like yesterday I was longing to eat ice cream but I control myself. So I awarded me a vitality point and will point. In the morning I did brush my teeth for full 2 minutes and was awarded 1 vitality point. Today I solve 20 math problems and was awarded 3 intellect point. I helped one of my friend in revision for tomorrow’s exam and was awarded 2 spiritual points. Isn’t it awesome. When bar is maximized you will gain a level and become a more healthy or more intelligent or improve your will power or become a better human being. I have tried this simple motivating technique personally. If you honestly follow it you will become better. There are many things in our life that do not look important and are neglected. Like do not brushing teeth properly may not affect in two or three days but what will you feel when you lose your teeth at ab early age. You may not help your friends in need and can lose them. These small small things may have negligence or no effects in short term but can ruin your life in the long run. As the result is slow and usually there is no immediate award there is a high chance that you will neglect or be demotivated to carry on with then. So this simple technique can keep you motivated and remind you of your targets. It is proven that humans tend to perform better when they have a challenge to conquer and a goal to reach. Also it will give you immense satisfaction and happiness when you level up that is a great prize in itself. It has changed my life for better. Hope the same for you. Thank you for reading. Hope you like it. Please share your thoughts with us.